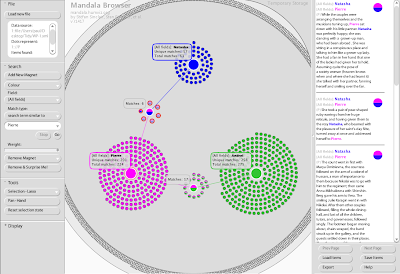 Stan Rueker, of Humanities Visualization, visited the Department recently and showed, among other visualization tools, Mandala. This lets you search an XML file and create collocations between words. To give you an example, I’ve loaded Book 1 of War and Peace, and looked for paragraphs that contain the names Natasha, Pierre, and Andrei. 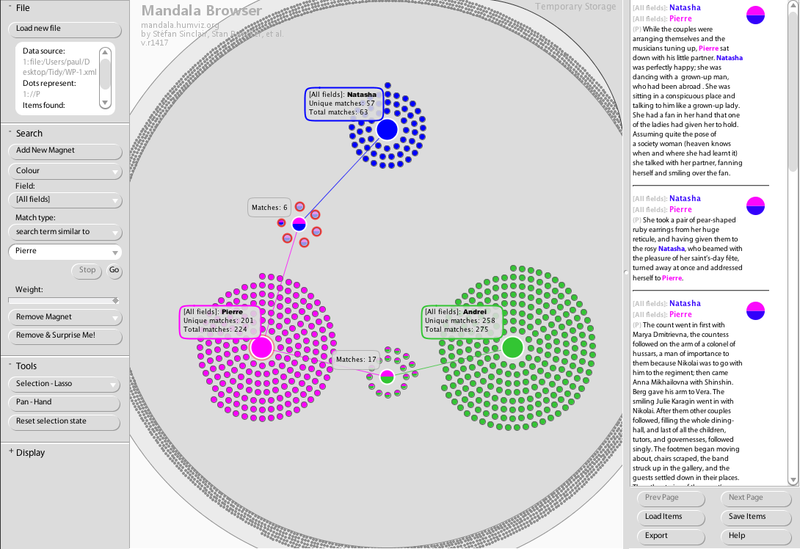 Mandala is presenting me with those that contain both Natasha and Pierre, and Pierre and Andrei. Paul Stiff raised an interesting objection to Stan’s visualizations, namely the problem of the circle in data graphics. It’s much less easy to instantly assess the relative sizes of circles than it is to assess the relative sizes of squares. Below I offer examples from the ManyEyes site that I think support Paul’s point of view. (While you are on the ManyEyes site, look at our own Gerry Leonidas as the subject of data visualization!